Fine Art or a Fine Mess? Murals spark debate in D.C.
On Tuesday, Greater Greater Washington’s Dan M. made the case for more murals in D.C. He wondered why "we accept so many blank spaces in our cities” when “detailed, colorful places are inherently more pedestrian friendly than dismal, blank spaces." He says blank walls around the city provide a perfect canvas for aspiring artists at D.C.’s schools, and suggests that WMATA "give each art student one concrete panel and let them go wild, as part of a class project." If a particular piece turned out badly, "10 minutes and a bucket of white paint" would solve the problem. Dave Jamieson, who covers pedestrian life issues for TBD, is skeptical. While he agrees that "visually interesting spaces are of course more inviting than blank ones," Jamieson says Dan M. "gets into dangerous territory" by offering up the space to students. "Every high school in America is filled with art students -- most of whom produce some pretty mediocre art," he writes. Noting that he was one of them, he adds, "God forbid I'd been encouraged to go wild on my own canvas, let alone a public space where thousands of pedestrians would have to pass (and cringe) every day." Jamieson doesn’t say there should be no murals, only that it would make more sense to offer "modest" commissions to professional artists seeking more exposure. Both writers make good points. I’m lucky enough to live in the Columbia Heights area, where there has been a technicolor explosion of murals over the past few years. The Prince of Petworth blog has photos of many of the highlights -- including one painted in part by First Lady Michelle Obama. But not all murals are great art. When locals wanted to repaint the graffiti-covered walls at a problematic park down the street from my house, the folks behind some truly unattractive renderings of Looney Tunes characters balked -- and so those images were left exposed while the rest of the walls were painted. And a few years ago, a group led by Sinclair Skinnerstarted painting a mural of Marion Barry on a wall owned by Howard University -- without the school’s permission. More recently, some Ward One residents were irked that a "spray-painted mural of a giant dog and children blowin’ bubbles," as Washington City Paper called it, went up in Walter Pierce Park without much notice. 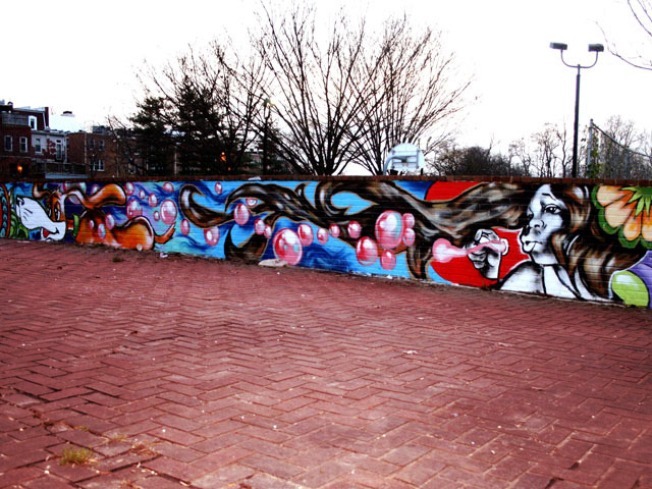 Even some of those who did not object to the artwork itself -- created as part of the MuralsDC project -- were upset that they had been blindsided. One critic told City Paper that only a single message on one neighborhood listserv announced the upcoming work. Public art makes city life better, but there’s room for debate over what kind of art should be presented. One thing is clear: The process needs to be open and inclusive, so all residents -- those who will do the painting, those who will see it, and those who will pay for it -- can have their say.